This week in Encinitas we saved this eucalyptus grove. I was initially alarmed when presented with this year’s proposed plan of action regarding this program. 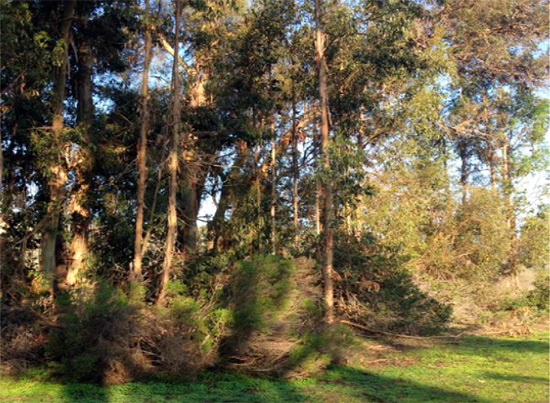 The city appeared to be taking an aggressive approach to invasive plant removal by proposing the destruction of more than a hundred eucalyptus trees in Indian Head Canyon, home to 52 acres of open space bounded by Saxony Road. This lovely hiking and mountain biking area is blessed with a eucalyptus grove that recalls the California of over a century ago. Raptor birds and migratory monarch butterflies call eucalyptus trees home. There are competing theories on the best ways to manage invasive plants, but I’m struck by the incongruity of ripping out mature trees in one part of our city, whether they are palms or eucalyptus, and then planting palms in our parks and right-of-ways that self-seed into our open space areas. Ice plant, another invasive, is not only planted, but watered and maintained, along our freeways. Our rail corridor in Cardiff is filled with ice plant, tumbleweeds, acacia and castor beans — all invasives — and because this area is managed by a different agency, the city has no oversight of the plants. This results in an uncoordinated approach. Creating the city’s invasive plant list involved lots of community input but unfortunately turning that list into action didn’t generate one email, phone call or speaker from the public. The proposed hit list of plants to remove in our open space wasn’t limited to the top ten worst offenders, like pampas grass and arundo that do choke off waterways, but was extensive, including edibles such as fennel. Taking out invasives without an ongoing, dedicated plan to water, weed and nurture the surviving and newly planted natives is a fruitless exercise. Additionally, hillsides stripped bare are at risk of washing away in rain storms, especially in wet years. And El Niño is predicted to make a big comeback this winter. There are some waterways in our city that merit particular focus, for instance the Cottonwood Creek watershed with its mouth at Moonlight Beach. The City is blessed to have an active, flourishing volunteer group, the Cottonwood Creek Conservancy, whose members regularly plant, weed, pick up trash and partner with the Boy Scouts to provide community service and wetland preservation there. This watershed is heavily used and loved, and provides habitat for birds and pollinators. The volunteers are experts and have come to City Hall at various times with concerns. They deserve a seat at the table in deciding what gets done. Partnering with established volunteer groups is the key to long term success. At our meeting, I felt a surge of gratitude for the professional approach and overall cohesion of the five members of our City Council. My strong desire to take a different approach than that recommended in the staff report in implementing the Habitat Stewardship Program was met with general agreement, and with relative ease we changed directions. We directed staff to work collaboratively with the city commissions and volunteer groups, to prioritize trail enhancement, sign repair, debris removal, erosion control and fire abatement, and to focus on the areas used by our residents instead of the islands of open space that are off-limits to people. Invasives removal and native replantings should be done hand-in-hand with volunteer groups. At times serving in this role on the City Council I can feel the polarization and partisanship, but on most issues, like this one, the council works together very well to guide our local government forward. In these cases, we take a moderate approach when faced with competing values, prioritize greater community outreach, build upon each others’ good ideas and improve past city government practices. Phase One of the project, starting spring of 2016, will build one carpool lane in each direction and take about five years to complete. Caltrans is in escrow to buy 20 acres of strawberry fields at the intersection of the I-5 freeway and Manchester. Five acres will be used for a Park & Ride, which will include bike lockers and other amenities for cycling as well as cars. The remainder of the land will be preserved as agriculture and open space. Here’s the Encinitas Advocate article. The Mackinnon Ave. bridge, which is near the new Encinitas Community Park, will be replaced, resulting in it being shut down and impassable for about a year. This is too bad because a large number of families use this bridge to get to and from home, work and school. The Community Park entrance near the bridge will also be closed for the year. Six soundwalls along the freeway will be built as part of Phase One. No roundabouts or other construction on Birmingham are planned for Phase One, although the city will be doing an extensive pavement and sidewalk improvement project west of I-5 on Birmingham in coming years. The city received a $4.6 million grant for an undercrossing beneath the railroad tracks at El Portal in Leucadia that will be very similar to the recently built Swami’s pedestrian crossing at Santa Fe Drive. The undercrossing will be for pedestrians and bikes only, allowing a safe, legal crossing from west of Highway 101 to east of Vulcan. It will make it much easier and safer for residents to walk or bike to the beach, local businesses and school. These types of infrastructure improvements enhance the quality of life for our residents, and make walking and biking a more realistic option for short trips. Thank you to fellow Council Member Tony Kranz for his advocacy. Here’s a San Diego Union-Tribune article about this exciting development. It appears we’re in the midst of a debate about the relative value of “complete streets,” which are streets that accommodate not just cars, but pedestrians and bicyclists too. Our streets are among the highest priority for the council – maintaining pavement, striping bike lanes, repairing sidewalks, etc. Almost all of our projects that improve bicycle access have very little effect on drivers. When a car travel lane is narrowed from 12 feet to 10 feet to make way for a bike lane, the traffic speed is reduced just slightly and it’s a major improvement for the cyclist. Here is an Encinitas Advocate article on the La Costa Ave street improvements, and another Advocate piece about a conflict on the Traffic Commission. Thank you for your ongoing interest in our city. Please don’t hesitate to email me if you’d like to share your thoughts on any topic. 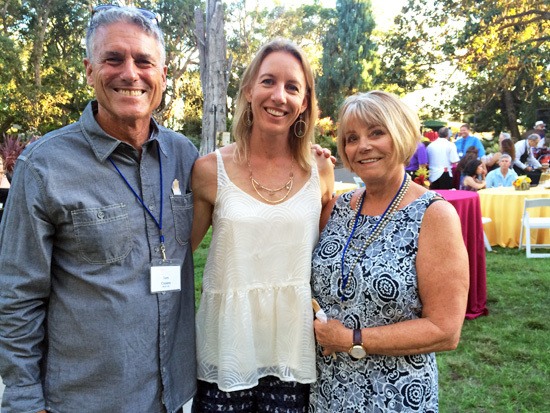 Chatting with Tom and Peggy Cozens at the San Diego Botanic Garden gala last weekend.